SCIENTISTS have taken a giant leap in their understanding of how the universe was formed, with a joint announcement in Geneva and Melbourne last night that a new particle has been discovered. The discovery has significant implications, as physicists say it is consistent with the elusive Higgs boson, or ”God particle”. In what will prove a milestone in the history of modern science, the revelation ends almost five decades of searching for the subatomic particle. The search included constructing – for almost $10 billion – the Large Hadron Collider 100 metres below the Swiss-French border to conduct experiments in conditions similar to those just seconds after the big bang. The preliminary results, delivered to applause and whoops of excitement in the two cities, come from two separate experiments undertaken this year at the Large Hadron Collider. They delivered satisfyingly similar results, making the new particle the heaviest boson discovered with a mass of about 125 GeV. ”This goes well beyond the origin of life, this is the origin of the universe,” said Geoffrey Taylor, who leads Australia’s research contribution to the organisation behind the Large Hadron Collider, the European Organisation for Nuclear Research (CERN). The announcement was made on the eve of the International Conference on High Energy Physics beginning in Melbourne today. Scientists packed the Melbourne Convention Centre last night for the announcement, with more than 800 physicists making the trip for the conference. physics – a rule book of how elementary particles and forces interact in the universe. ”What the results have shown tonight is that this is statistically highly significant. 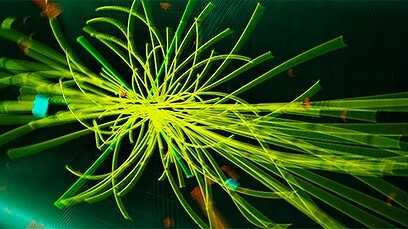 It has all the hallmarks of the standard model Higgs,” Professor Taylor said. The existence of a Higgs-like boson effectively verifies the all-encompassing 30-year-old theory on why particles have mass and how the universe works at the simplest level. ”We have reached a milestone in our understanding of nature,” said CERN director-general Rolf Heuer, who will arrive in Melbourne for the conference tomorrow. Among the many hundreds at CERN’s Geneva base for the announcement was the man whose name the elusive particle takes, retired British theoretical physicist Peter Higgs. Now in his 80s, Professor Higgs congratulated the international team of researchers for their ”tremendous achievement”, saying that ”it is just an incredible thing that it happened in my lifetime”. The unassuming Higgs could now be on his way to winning a Nobel prize. The preliminary results unveiled last night are from experiments run independently at two of the giant atom-smasher’s four detectors – ATLAS and CMS. Both have been working on the hunt for Higgs, which is difficult to track down as it can’t be seen. The unstable particle lives for only a tiny fraction of a second before decaying into other particles. Yesterday’s confirmation follows tantalising results released in December, which allowed physicists to narrow down the region in which they were searching for the Higgs boson. Since then the sensitivity at the Large Hadron Collider has increased, while scientists have also refined their analysis techniques. The volume of data available this year was also vastly greater. According to CERN, there was more data delivered from experiments at the Large Hadron Collider between April and June this year than during the whole 2011 run. Having identified the new Higgs-like particle, physicists now have the task of establishing its properties and characteristics and then measuring the results up against the predicted properties of Higgs boson. It could yet be that the discovery is even more extraordinary – the new particle could turn out to be an even more exotic version that would be a profound discovery and create a revolution in physics. Either way, last night’s results have set science on a new path. ”This is really a very unusual object, an unusual field,” Professor Taylor said.